Driving into The Woodlands, 27 miles northwest of downtown Houston, you’re immediately struck by the scarcity of signage along main roads. 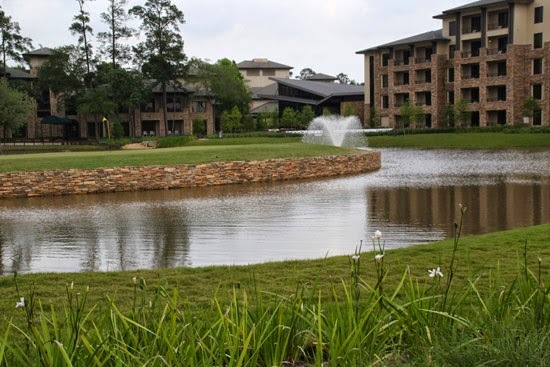 The master-planned community was designed to take advantage of its heavily wooded landscape, so shopping centers are tucked behind mini-forests, and few signs tell what businesses are hidden there. It’s a feature both welcome for its attractiveness and potentially confusing to newcomers. But the balance sheet weighs heavily in favor of the design George Mitchell chose for this development more than 50 years ago. 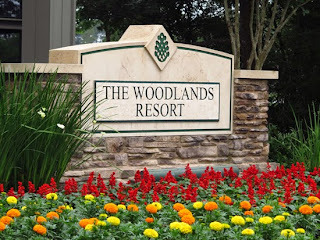 The idyllic, wooded setting has been a primary draw for corporate events and leisure travelers for many years, so it’s not surprising that strong growth necessitated expansion of The Woodlands Resort. Larry and I visited recently to check out changes and improvements that were completed at the end of 2014. Beautiful landscaping add to the attractiveness of the resort. It’s easy to see why the $75 million renovation project has turned The Woodlands Resort and Conference Center into a popular destination for meetings and family vacations. 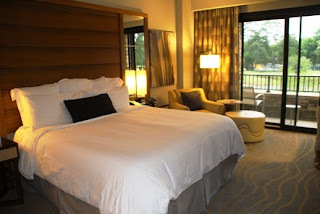 During the 20-month project several major changes took place including adding a new wing of 184 guest rooms and suites, renovating 222 existing guest rooms, designing a 3,000 square foot living/gathering room that connects the three guest wings, creating a lazy river that winds 1,005 feet through the surrounding forest, and opening a high-end steak house with an outdoor patio adjacent to the 18th hole of Panther Trail, the resort’s signature golf course. Soothing landscapes are found throughout the property. 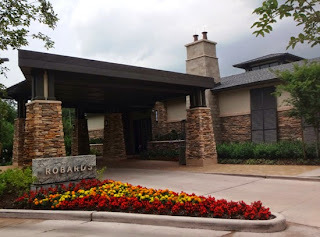 During our visit, we enjoyed happy hour at Robard’s (4-6 p.m.), the new 136-seat steak restaurant and lounge. Some patrons are regulars as the restaurant is open to the public, not just resort guests. Draft beers were $2 off and wines $3 off regular prices, or sip on a Texas Pear Margarita for $6. Even better was the Iron Skillet appetizer, a zesty bolognais sauce with meat, topped with Mozzarella cheese and served with homemade French bread. Yummy! entrees are in the $30-45 range. Rooms have been added or renovated to follow the same standard. We also savored the sumptous breakfast buffet and dinner in The Woodlands Dining Room (steak for Larry; salmon for Beverly). Other food outlets include The Royal Mile Grille for lunch and The Bistro for drinks and appetizers. Cool Water Café located poolside at Forest Oasis Waterscape is open seasonally. Robard's is the new high-end steak restaurant at The Woodlands Resort. Plentiful water features throughout the property had a cooling effect, which is probably needed more during the summer than our May visit. But listening to the soothing sounds of spraying water from our balcony and while walking around the property was a pleasant plus. Golf at the Oaks course on a pleasant, sunny day. 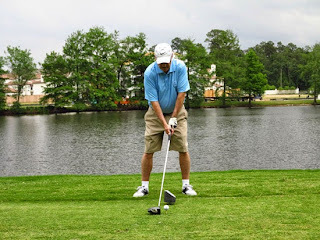 While there we played the adjacent Oaks golf course, a new member of Club Corp. It features large, rolling greens, generous fairways, and numerous bunkers. Majestic oak trees line the fairways and hide most homes from view. However, if your ball disappears into the trees, chances of finding it are slim. Bordering Lake Harrison, the 18th hole is a good example of the course’s natural beauty. 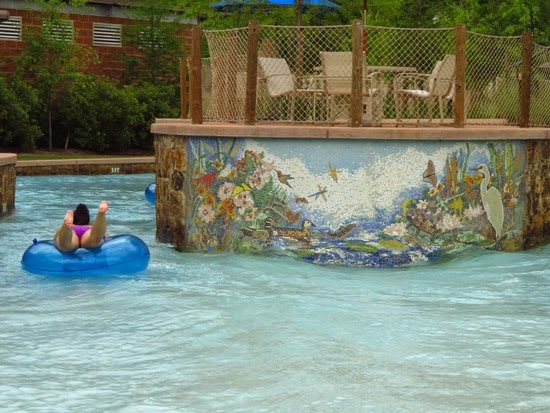 An exquisite mural adorns one wall of the lazy river course. This summer families will especially enjoy the five swimming pools with spas, waterfalls and slides. The new lazy river with spiral plunge slide is already getting rave reviews from guests of all ages. Energetic guests can work out at the Fitness Center or settle for supreme relaxation with a massage at the Health Spa (thanks, Roxanne!). 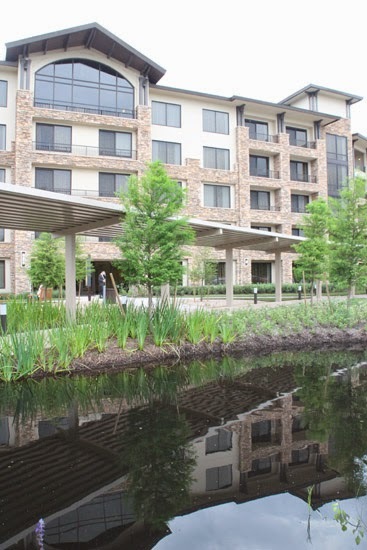 There’s really no reason to leave the resort, but if you need more entertainment venture out for world-class shopping at The Woodlands Mall, Market Street, or Old Town Spring. Perhaps you’ll want to attend a concert at the nearby Cynthia Woods Mitchell Pavilion. 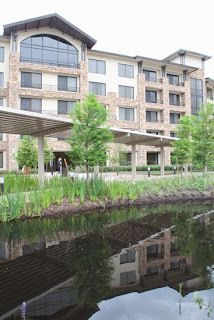 More than 194 miles of jogging and biking trails wind throughout The Woodlands, too. And if business brings you to The Woodlands Resort, you'll find full conference facilities.